The old fashioned Salisbury steak entered many places around the world including Korea. We call it Hambak steak (함박스테이크). The word “hambak” came from Hamburg, Germany where the hamburger patties are believed to be originated. 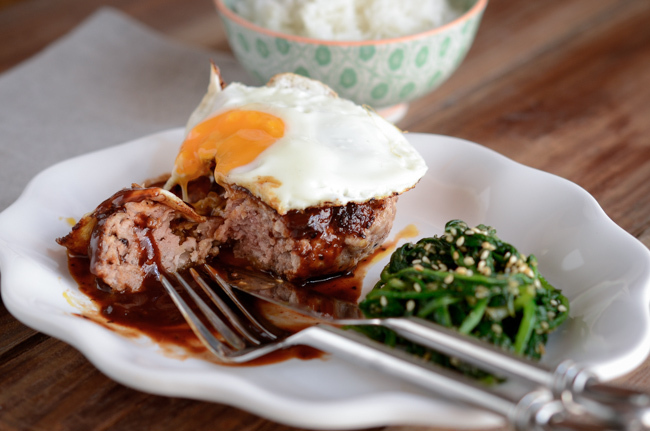 However, Korean hambak steak was perhaps most influenced by the Japanese version of Salisbury steak, the “Hambagu”. Hambak steak was one of my favorite western foods when I was growing up. I remember how excited I was whenever my parents took me and my sisters to the Hambak steak restaurants. The special treat didn’t come that often, so I had to enjoy every bite of it. Every restaurant seemed to have different way of making this delicious and comforting steak. I like my Hambak steak made with the rich red wine sauce, quite similar to Japanese Hambagu. Now here is how I make. I like to saute the onion in butter until they are slightly golden. Mix ground beef, ground pork, panko breadcrumbs, egg, and milk. Season with salt and pepper. I also like to add a little bit of nutmeg. The nutmeg brings such a nice fragrance to the patties. Form the patties slightly thick. As you form the patties, with the strong force (as if you are hitting the patties) throw the patties from one palm of your hand to the other several times. This helps the patties to hold together tightly as you cook. Cook over medium-low heat until the crust gets browned. Then reduce the heat to low and cover with a lid. This will help to cook the paaties all the way without burning the crust. 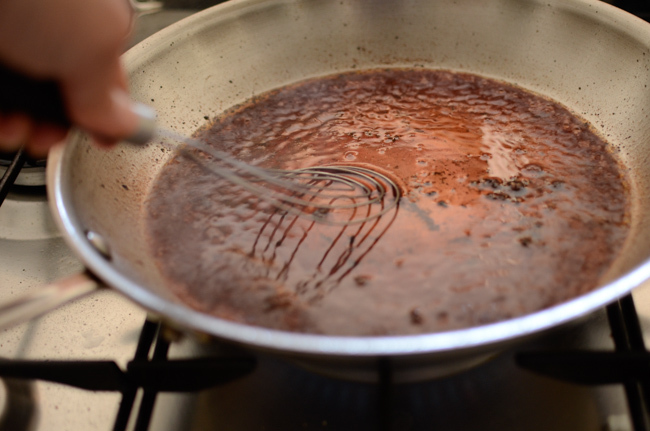 Remove patties from the skillet, raise the heat and add the red wine. 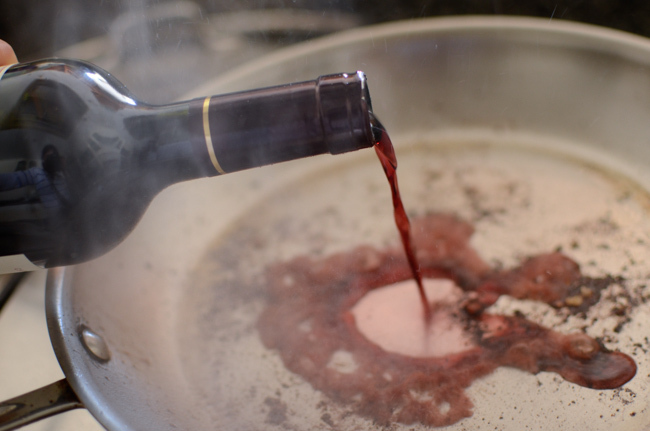 Scrape any bits of meat crumbs, then reduce the wine a little bit to evaporate the alcohol. Add the rest of the sauce ingredients. 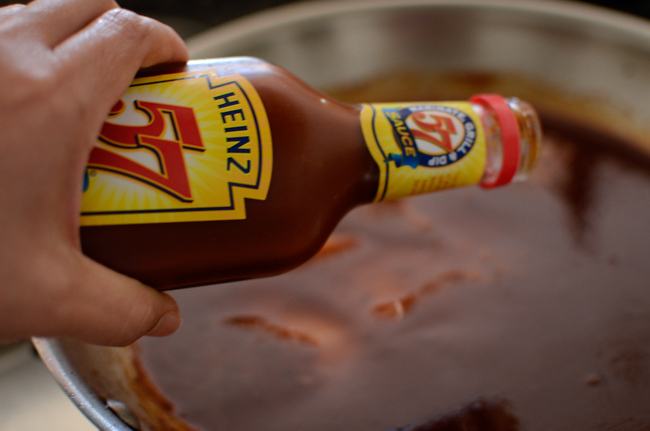 My families are Heinz 57 royal fans, so it would be my choice. But if you are A1 sauce person, go for it. I also like to top the steak with a fried egg on top. I love how the velvety golden yolk wraps the rich flavored sauce and enhances the flavor all together. And the hambak steak patties? So tender and juicy! It makes a great meal with some rice and a vegetable side dish (or simple salad). Hope you can try this flavorful rich steak when you are in the mood for something different than the boring chicken casserole for dinner. You won’t regret! 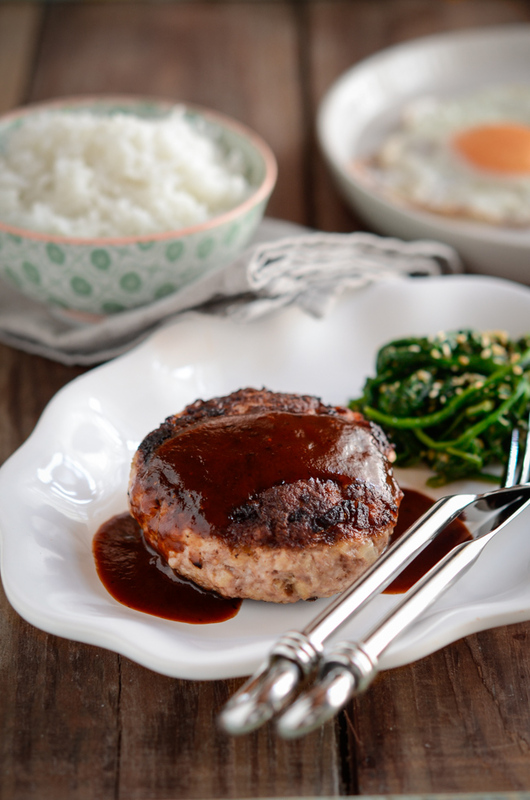 Hambak steak is the Korean-style Salisbury steak, similar to Japanese Hambagu. 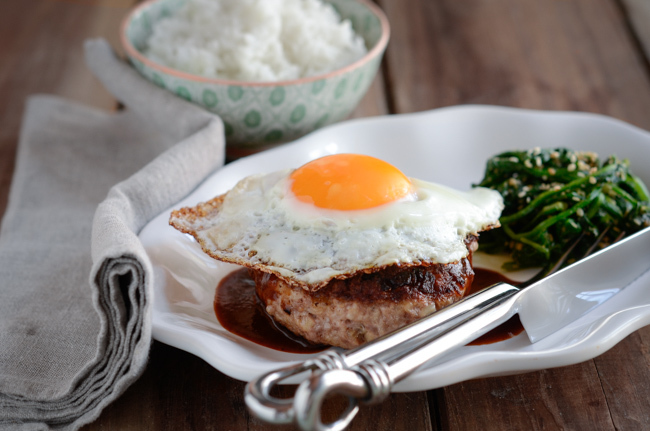 The addition of fried egg on top enhances the rich red wine sauce and the velvety texture of the steak. 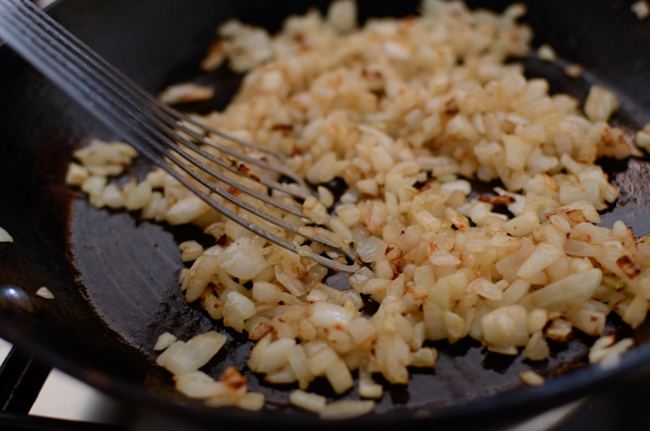 In a skillet over medium heat, saute onion in butter until golden and soft. 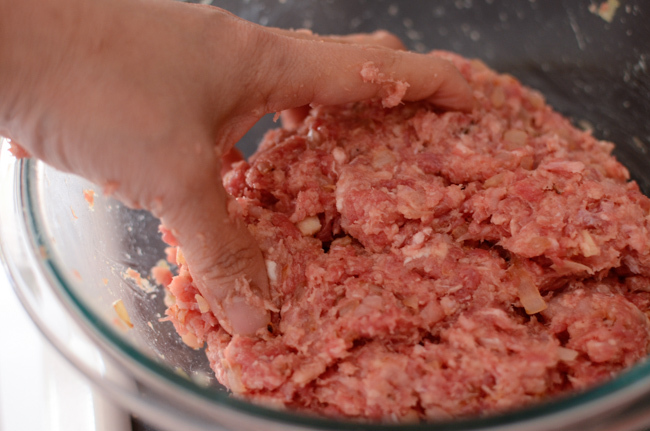 In a large mixing bowl, combine beef, pork, sauteed onion, egg, breadcrumbs, milk, and nutmeg; season with salt and pepper and mix everything well with your hand. 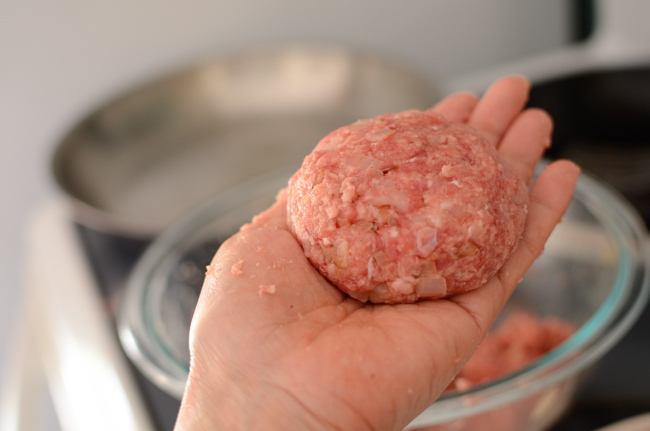 Take a portion and form into a patty, then throw it forcefully from one palm of your hand to the other several times as if you are hitting the patty. This will enhance the texture of patty and hold its shape during the cooking. Repeat the rest of the patties. Poke the patties with your finger in the center to leave indentation. 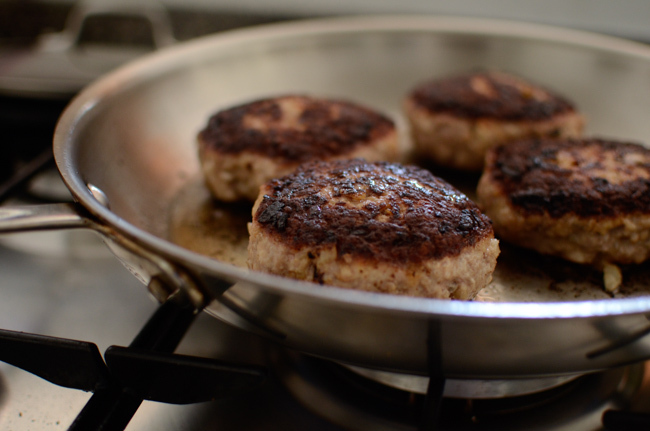 Heat skillet over medium heat, add some oil and drop the patties to sear the outside, about 2-3 minutes per side. Then reduce the heat to low and continue to cook. You can cover with a lid leaving a little opening for the steam to escape. This will ensure to cook the patties all the way. Remove the patties to a plate and keep warm. 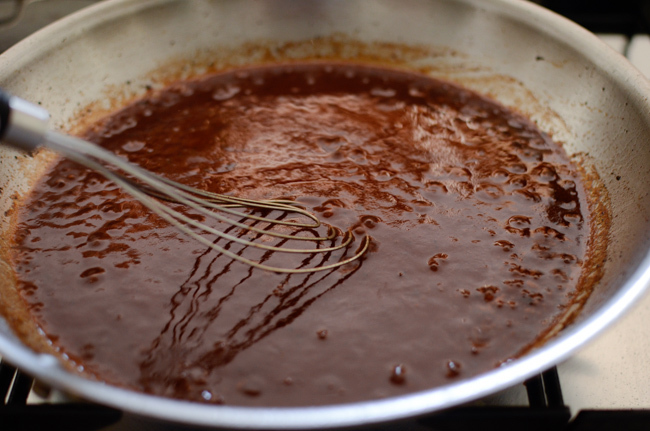 To make the sauce; raise the heat under the skillet where you cook the patties, splash the red wine and scrape off any meat pieces left in the skillet with a whisk. Let the wine reduce in half. Serve the steak with steamed rice and vegetable (or salad). Delicious! We had this tonight for dinner and I loved every bite! This recipe will be added to a regular for my family. Thank you! Wonderful! So happy to hear that you loved it. Thanks for the comment! This receipt really blew my mind!! First of all I love hamburger steak and secondly it was sooo flavorful even though there aren't too many ingredients needed. My husband and two toddlers loved it as well. The only thing I did differently was using all beef and I ended up shimmering the patties in the sauce. I served it with a side of steamed broccoli & rice... So yums!! That is so great that your family loved this steak, Jane! Way to go! I like the idea of simmering the patties in the sauce. Thanks for your comment. That wine sauce looks terrific! And I can never resist a fried egg on anything. ;-) Fun dish -- thanks. I know, right? I love fried egg on anything, too. Thanks John!